Savage Oak is the brand for our Wild and Sour beer program. These beers are all brewed in our Savage Oak Room, separate from our “clean” brewery and barrel aging space. All of these beers are aged in oak foeders or barrels and use Brettanomyces (wild yeast), souring bacteria, or a combination of both. None of these beers are kettle soured, we use our own custom blends of Brett and Bacteria to produce beers with a wide range of flavors from fruity and sour to funky. 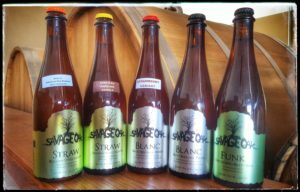 Below are some of the beers we produce in our Savage Oak Program. We also do several fruit variants of these beers where fruit is added directly to a barrel or to a fermenter after Foeder/barrel aging to allow the simple sugars to ferment. This allows the Brett and Bacteria to continue to develop and prevents the beer from being too sweet. -Blanc- Foeder Aged Berliner Weisse- Our take on a Berliner Weisse is not kettle soured, it is fermented with a mix of Lactobacillus bacteria and our custom blend of Brettanomyces. No Saccharomyces (regular beer yeast) is used to make this beer. The beer is then aged in an Oak Foeder to allow the flavors to develop and mellow. The result is a more complex version of the style with a smooth sourness and notes of citrus, berries, orchard fruits, tropical fruits, and oak. Available year round. -Gold- Lambic Inspired Sour Golden Ale- Inspired by the Lambics of Belgium this beer is brewed with a healthy portion of wheat malt, flaked wheat, and flaked oats, for a bit of body. The beer is aged for over a year in oak barrels with a different blend of wild yeast and bacteria in each barrel. We pick our favorite barrels (soon to be used to seed our Gold Foeder) and blend them together to produce a complex beer with a prominent but smooth sourness and notes of stone fruits, tropical fruits, oak, and a pleasant earthy funk. Summer/Fall release. -Ruby- Flanders Inspired Sour Red Ale- Our take on the sour red ales of Flanders. Brewed with Munich and Caramunich malts for a toasty, slightly sweet malt character. This beer is aged for over a year in oak barrels with a different blend of fruit forward Brett strains, Lactobacillus and Pedioccocus bacteria in each barrel. We then select our favorite barrels (soon to be used to seed our Ruby Foeder) and blend them to create a complex beer with a moderate sourness and notes of pie cherries, stone fruits, toasted bread and toffee. Fall/Winter release. 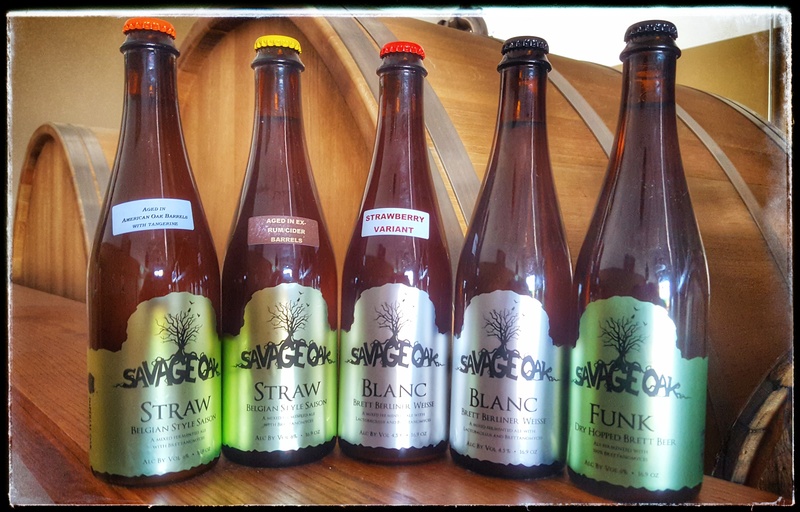 These are the Savage Oak versions of our strong Belgian beers aged in fresh wine barrels with Brettanomyces and/or bacteria, and fruit. The fruit is added to the barrels to prevent the beers from becoming sweet and to add complexity. -Brother- Imperial Honey Saison with Brettanomyces and Pear- Our Brother’s Keeper, Imperial Honey Saison, aged for a year in fresh white wine barrels with our blend of Brettanomyces and Pear juice. Released once a year, usually in August. -Abbey- Belgian Stout with Brettanomyces and Raspberry- Our Dark Abbey, Imperial Belgian Stout, aged for a year in fresh red wine barrels with our blend of Brettanomyces and Raspberry juice. Released once a year, usually in February. savage oak, sour, wild. Bookmark.